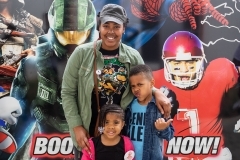 You’ve looked all over for a better birthday party in the Atlanta area…now you’ve found it! 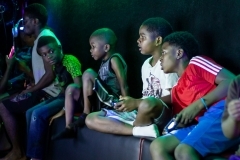 TLab Mobile Gaming & Music Production brings you our luxury video game theater, with comfortable stadium seating, Virtual Reality gaming and 7 gaming stations, enough for 28 to play at once! We’ve got the best games, laser and neon lighting, and much more! 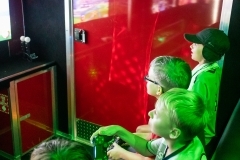 Our Game Coach runs the birthday party while your guests have the time of their lives inside and out! 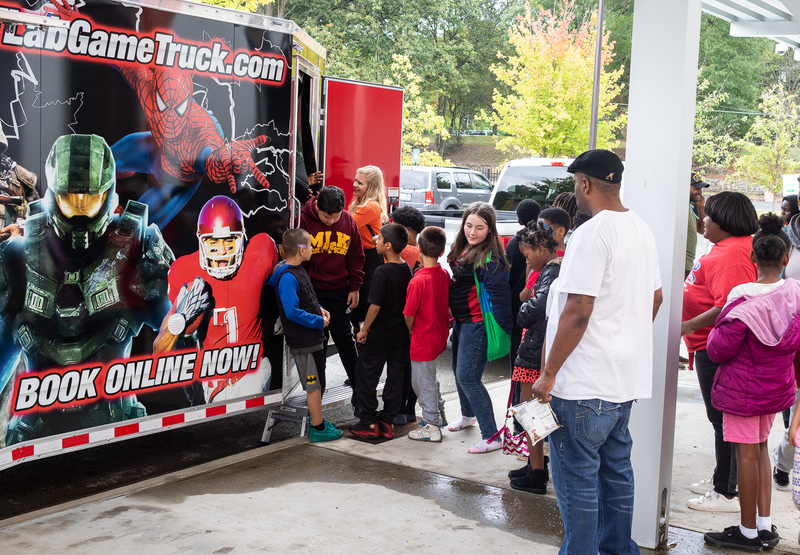 Your guests will be amazed and excited the moment they see the TLab game truck arrive! 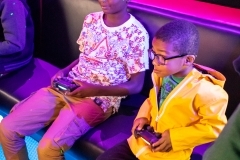 In the TLab game theater, not only will you have an amazing time playing the latest in video game technology, you will have the opportunity to unleash the inner music producer you never knew you had inside. Using industry leading Digital Audio Workstation (DAW) software, you will be able to create beats and musical loops in minutes! 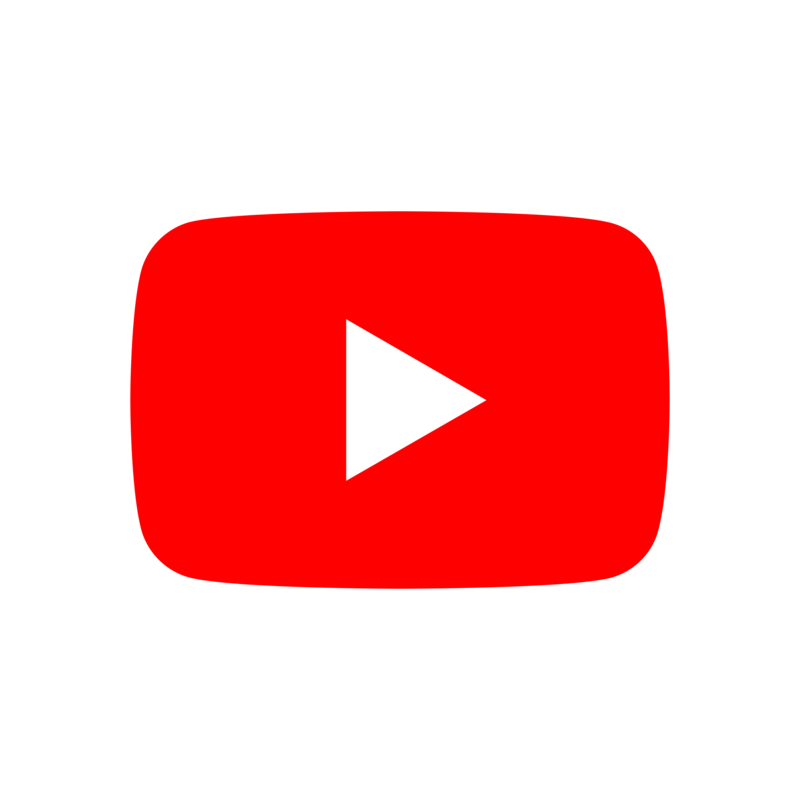 Quickly you will be making hit tracks like the pros. The best thing about it, we’ll provide you with a link to download your own custom MP3 files! TLab Mobile Gaming & Music Production has Metro Atlanta’s best entertainment for your corporate or promotional needs! 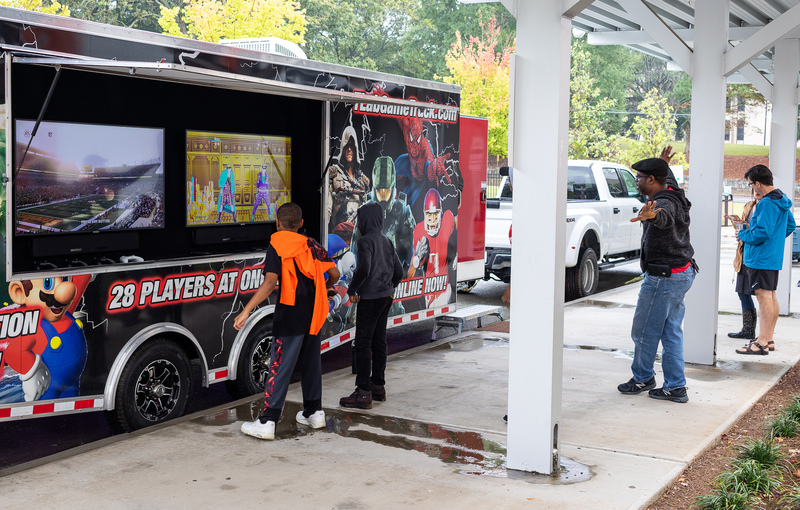 Company picnics, grand openings, product launches, employee rewards, even corporate team building…our video game & music production theater comes right to your business parking lot or other location and will entertain your guests like no other venue can! With great games, indoor and outdoor stations, great dance and sports options and a high-tech mobile music production studio, we’ll keep the party going all day if needed! School & Non-Profit Functions in Dekalb County, Fulton County & more! Looking for a new entertainment idea for your school function, church group, summer camp or other non-profit group? How about ideas for fundraisers and festivals? 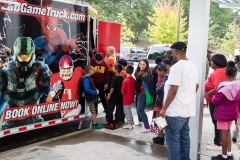 We bring Georgia’s ultimate mobile video game truck and trailer right to your event! 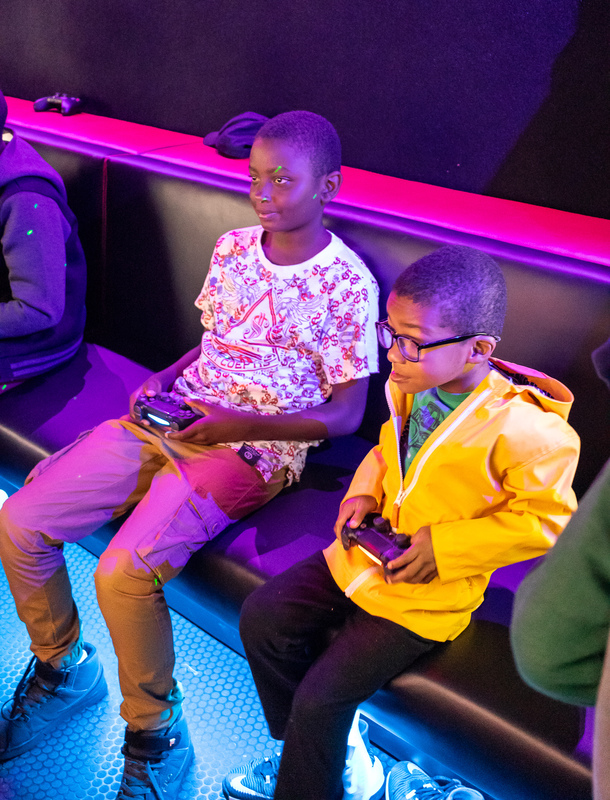 We have climate-controlled seating for 26 inside our luxury game truck, and gaming consoles and wireless controllers so 28 can play at once, indoors and out (weather permitting!) Our mobile music production lab allows your guests to create impressive loops and tracks and take them home with them! We can rotate players to entertain even the largest crowds! You can raise funds by selling tickets for timed intervals or by selling wristbands for play-all-day fun! We can even bring a photo booth to provide lasting memories of your event (at an additional cost)! 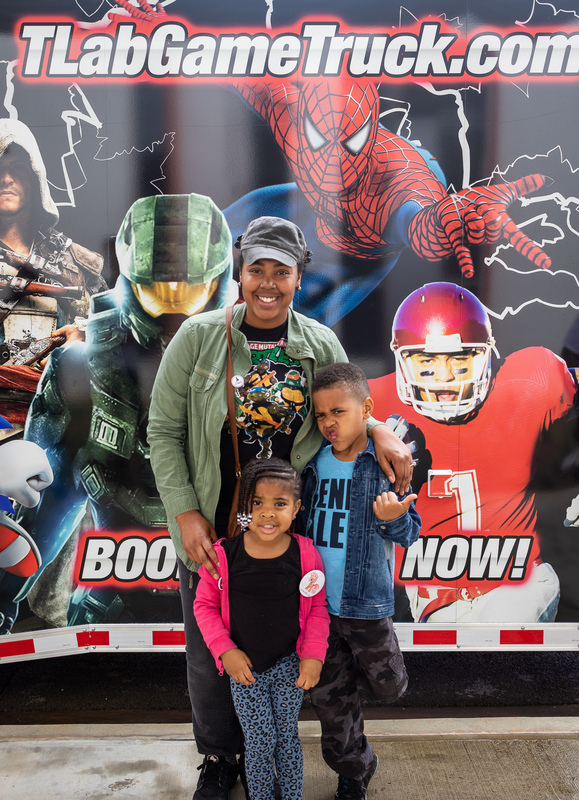 The TLab Mobile Game Theater was designed to be accessible to all guests! We are ADA-compliant and offer a custom ramp, wide entry/exit doors and a wide, flat floor area. Everybody gets to play! 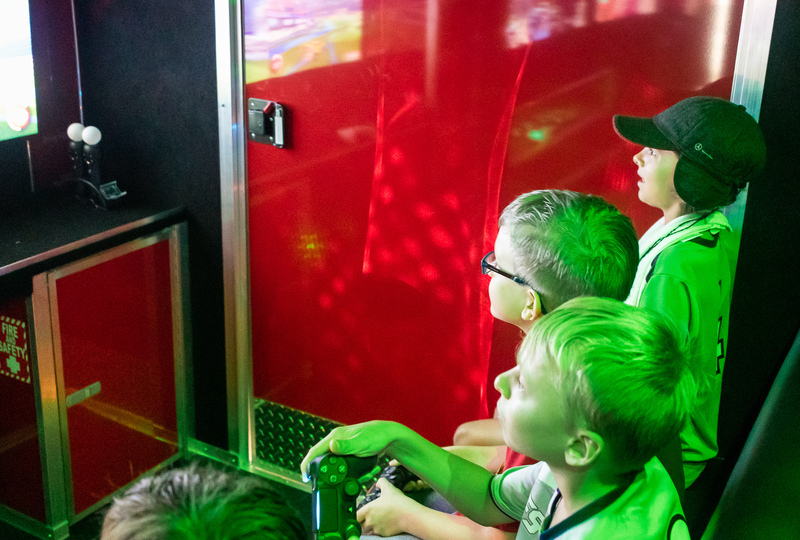 We have 7 high-definition screens so players can enjoy action, dancing, and sports games like Minecraft, Madden Football, FIFA Soccer, Just Dance and Wii Sports! TLab Mobile Gaming offers your guests online gaming! Play Fortnite or other online games in the comfort of our luxurious game theater! (Additional fee applies for online gaming.) 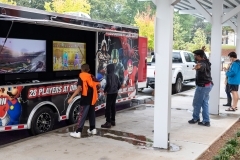 Customer must have high-speed internet connection (cable modem or router) within 300 feet of our game truck for connection. Don’t just play the game…get in the game! Our amazing VR gaming station with headset and virtual reality controllers lets your guests immerse themselves in a virtual gaming world, and others can follow the action on the VR screen! We have the best game consoles and plenty of wireless controllers! We’ve got PlayStation 4, PlayStation VR, XBox One S, and Nintendo Switch! In the TLab, not only will you have an amazing time playing the latest in video game technology, you will have the opportunity to unleash the inner music producer you never knew you had inside. Using industry leading Digital Audio Workstation (DAW) software, you will be able to create beats and musical loops in minutes! In no time, your guests will be making hit tracks like the pros! The best thing about it, we’ll give you a link to download your own custom MP3 files! 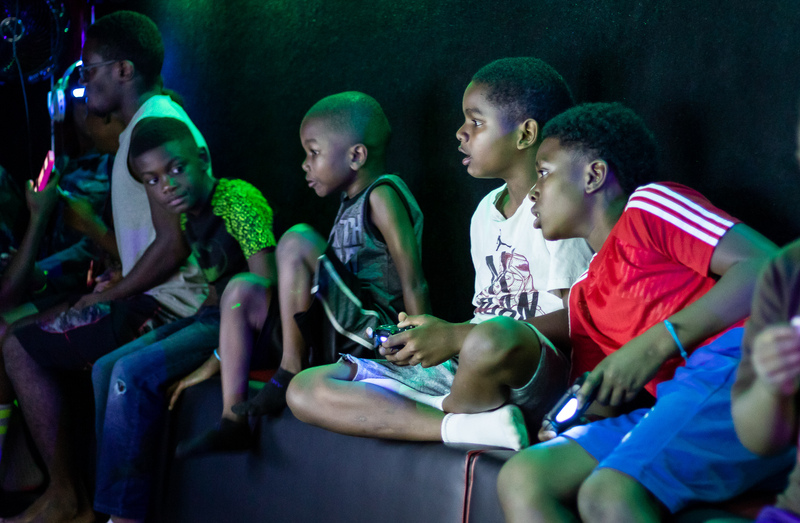 For a full blown multi-player experience, our game theater has 7 gaming stations, supporting up to 28 players. (Outside gaming stations are weather permitting.) We rotate players for large groups, and everybody gets plenty of action-packed playing time! Book your TLab party today!